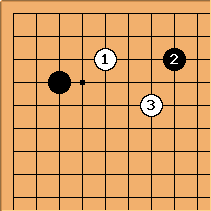 The shape created by the two White stones is called hazama tobi in Japanese. It has the obvious defect at the marked point (hazama, literally 'empty space'), but can be a powerful move in the right circumstances. 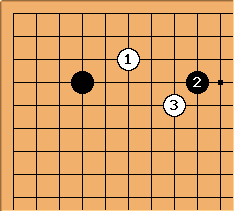 In joseki, there are two main uses from the 3-4 point. This pincer isn't often played now, so is rarely seen. Popular enough in the first half of the twentieth century. This is a typical sequel. 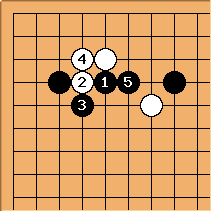 This is still current as joseki. 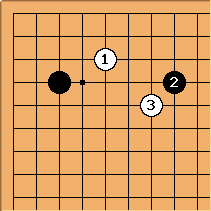 This leads to a large-scale sacrifice variation known as the Kajiwara joseki. 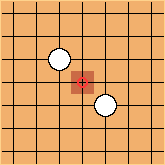 White gives up around 20 points in the corner for the sake of imperfect outside influence. Not an easy line in practice. It is still being played by the pros. See 3-4 point low approach two-space high pincer hazama tobi. 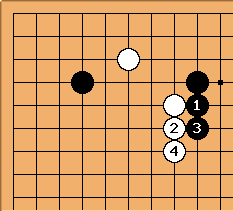 White can also play this way for the corresponding 4-4 pincer. White probably played that way to gain influence; so Black 1 and so on are natural, starting a pushing battle in the centre. 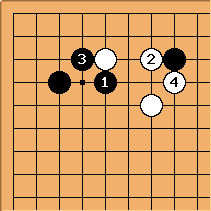 Black has to be careful not to create difficulties for the corner 4-4 stone, though. It isn't easy to say when Black can or should stop pushing.